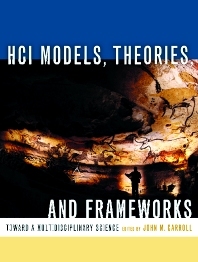 HCI Models, Theories, and Frameworks provides a thorough pedagological survey of the science of Human-Computer Interaction (HCI). HCI spans many disciplines and professions, including anthropology, cognitive psychology, computer graphics, graphical design, human factors engineering, interaction design, sociology, and software engineering. While many books and courses now address HCI technology and application areas, none has addressed HCI’s multidisciplinary foundations with much scope or depth. This text fills a huge void in the university education and training of HCI students as well as in the lifelong learning and professional development of HCI practitioners. Contributors are leading researchers in the field of HCI. If you teach a second course in HCI, you should consider this book. This book provides a comprehensive understanding of the HCI concepts and methods in use today, presenting enough comparative detail to make primary sources more accessible. Chapters are formatted to facilitate comparisons among the various HCI models. Each chapter focuses on a different level of scientific analysis or approach, but all in an identical format, facilitating comparison and contrast of the various HCI models. Each approach is described in terms of its roots, motivation, and type of HCI problems it typically addresses. The approach is then compared with its nearest neighbors, illustrated in a paradigmatic application, and analyzed in terms of its future. This book is essential reading for professionals, educators, and students in HCI who want to gain a better understanding of the theoretical bases of HCI, and who will make use of a good background, refresher, reference to the field and/or index to the literature. Professionals, educators, and students in human-computer interaction (HCI) who want to gain a better understanding of the theoretical bases of HCI, and who will make use of a good background, refresher, reference to the field and/or index to the literature. John M. Carroll is Professor of Computer Science, Education, and Psychology, and Director of the Center for Human-Computer Interaction, at Virginia Tech. He has written more than 250 technical papers, more than 25 conference plenary addresses, and 12 books. He serves on 10 editorial boards for journals and handbooks, has won the Rigo Career Achievement Award from ACM, received the Silver Core Award from IFIP, and is a member of the CHI Academy.